It's tough for parents in Garba Tulla to embrace the importance of education, especially for their girls. Most classrooms are not equipped with desks, and they often lack water sources. Inadequate equipment and poor access to schools in general have led to widespread absenteeism and high dropout rates. Many children do not go further than primary school because secondary school tuition fees are often beyond the reach of their parents. Only 13% of households have adequate diversity and nutrition in their diets, which leaves pregnant women and children vulnerable to malnutrition. Nearly 20% of children are underweight. Malnourished children are susceptible to diseases spread by poor sanitation and hygiene practices. Many children orphaned by AIDS-related deaths are unable to fend for themselves, and people living with HIV often can't meet their basic needs. The stigma associated with HIV and the discrimination against people living with AIDS is widespread, while access to anti-retroviral medication is limited. Ongoing drought is causing livestock and crop productivity to decline. Poor livestock breeds and outdated irrigation techniques make it tough for families to feed themselves and to earn a living. Limited access to markets and a lack of varied economic opportunities perpetuate the cycle of poverty, leaving more and more families reliant on relief supplies. The Garba Tulla community borders the renowned Meru National Park, home to elephants, hippos, rhinos, lions, and other wild animals. The district is hot and dry most of the year, with scarce and unreliable rainfall averaging 580 mm per year. Ongoing drought has made daily life a struggle to survive. Over 95% of families depend on livestock, crop production, and marketing as their sources of income. Raising livestock is embedded into the cultural way of life, and everything revolves around it. However, recurring drought is having a serious impact on livestock and crop production. 74% of the population lives below the poverty line, and this number is increasing. Garba Tulla is one of the neediest communities in the country. Educate community members on the importance of education for all, especially girls and women. Equip schools with desks, educational supplies, and improved water sources. Establish community-led bursaries so more students can access secondary and post-secondary education. Support the establishment of kitchen gardens. Improve access to clean water, proper sanitation, and hygiene education. Improve maternal and child health by teaching the importance of breastfeeding, immunization, and proper nutrition. Educate youth and adults in avoiding HIV infection. Help safeguard the rights of the most vulnerable. Train and support farmers to use more effective techniques in crop and livestock production. 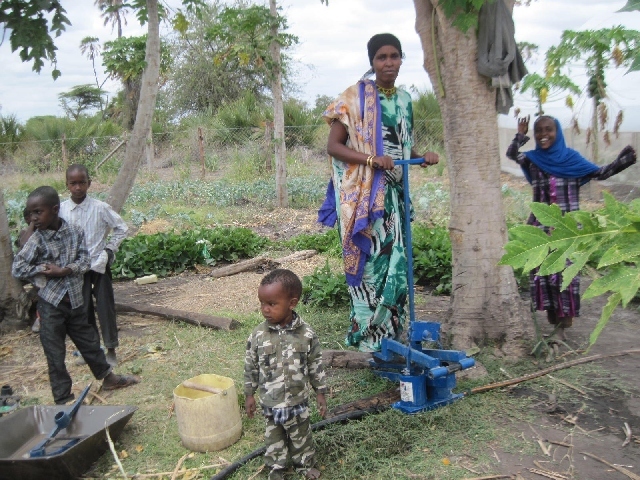 Expand small-scale irrigation and water projects. Help women's groups develop income-generating activities.